On March 24, 2018, news broke that a prominent law firm was forcing its incoming summer associates to sign an arbitration agreement with a non-disclosure provision. That firm’s mandatory arbitration and non-disclosure provisions covered all employment-related claims between the employee and the firm, including discrimination and harassment claims. Mandatory arbitration agreements and overbroad non-disclosure agreements (NDAs) are harmful in the employment context because they silence victims, conceal wrongdoing, and push discrimination and harassment claims into secretive proceedings that favor employers over employees. Fortunately, a group of law professors and students focused attention and applied public pressure on this particular law firm’s policy. The firm then decided to drop the NDA and mandatory arbitration requirement not only for summer associates, but also for all associates and staff. Since then, at least two other prominent law firms have publicly announced that they too will no longer require employees, including associates, to sign contracts containing arbitration agreements. Berkeley Law Students sent an open letter to Berkeley Law’s Career Development Office asking it to prohibit employers from using its services if that employer requires any employee, including associates, staff, or summer associates to agree to, as a general condition of employment: (1) a mandatory arbitration agreement, or (2) a non-disclosure agreement that covers discrimination, harassment, or other workplace misconduct. We call on Georgetown to do the same. These types of agreements may be legal, but they cut against core Georgetown values. 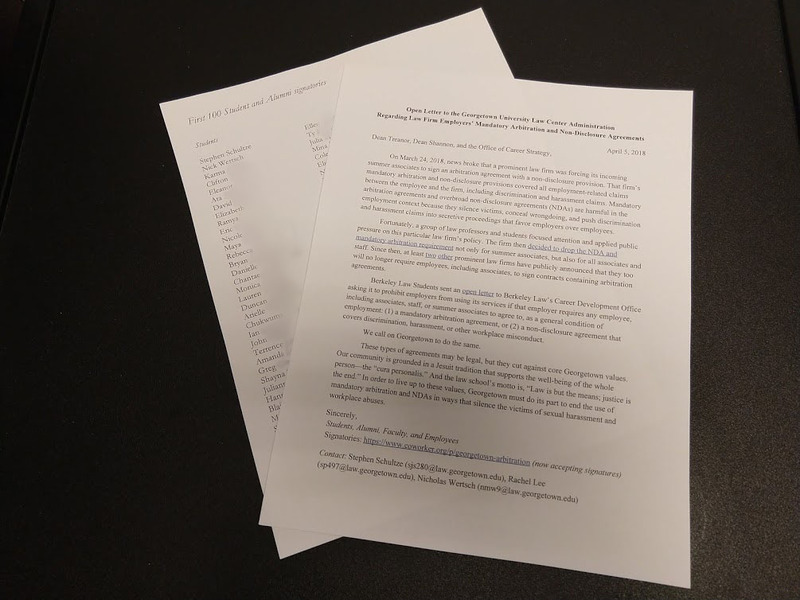 Our community is grounded in a Jesuit tradition that supports the well-being of the whole person—the “cura personalis.” And the law school’s motto is, “Law is but the means; justice is the end.” In order to live up to these values, Georgetown must do its part to end the use of mandatory arbitration and NDAs in ways that silence the victims of sexual harassment and workplace abuses. This movement is way overdue. And not just for law jobs but all jobs. This type of protection for abusers must stop. CNN: "Supreme Court ruling helps silence worker lawsuits. But these law students are fighting back"
Law.com: "New Study Finds Most Law Firms Mum on Mandatory Arbitration for Summer Associates"
American Lawyer: “Will Law Firms Bow to Pressure to End Mandatory Arbitration?" But only about half of the firms actually responded. We have more work to do! Here are some observations from Professor Leah Litman, who said that the low response rate "blunts any effort to enable even the most minimal feedback mechanism to address mandatory arbitration—namely, to allow students to make a decision about whether they will go to a firm that employs mandatory arbitration or not." Harvard Law students have started their own petition on coworker.org, based on our approach. 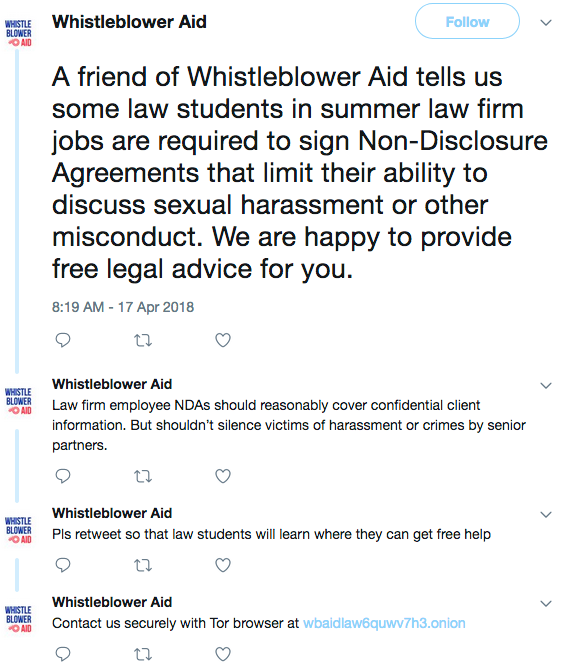 "A friend of Whistleblower Aid tells us some law students in summer law firm jobs are required to sign Non-Disclosure Agreements that limit their ability to discuss sexual harassment or other misconduct. We are happy to provide free legal advice for you. Law firm employee NDAs should reasonably cover confidential client information. But shouldn’t silence victims of harassment or crimes by senior partners. Pls retweet so that law students will learn where they can get free help. Contact us securely with Tor browser at http://wbaidlaw6quwv7h3.onion "
Our petition got a shout-out on this week's episode of the popular Supreme Court podcast, "First Mondays." We'll also be at the petition table in the McDonough cafeteria during lunch hours this Wednesday, Thursday, and Friday. Stop by and say hello! We reached our next goal of 200 signatures! We will deliver your signatures to Dean Shannon and report back. Also, we have now heard from student organizers at many other schools, and are happy to report that they too are pushing for our shared goals. Georgetown Professor Adam Levitin wrote about the difference between prohibiting firms that require arbitration (as we ask) and merely requiring firms to disclose their practices. He recognized that "schools are reluctant to be overly paternalistic," and some students may fear that a prohibition would limit their job prospects. However, he thinks that a disclosure regime would introduce perverse incentives that would hurt schools and students in the long run. Based on his reading of the consumer disclosure literature, he concludes that the disclosure approach is "ridiculously sanguine." But he admits that schools will probably end up choosing it anyway. In his view, "Law schools of all places should be better than this and not fall for the same worthless disclosure route that has been the dominant method of consumer contract regulation for the last 75 years or so. We owe it to our students." Law Professor Leah Litman at University of California Irvine posted an update on developments at other law schools. 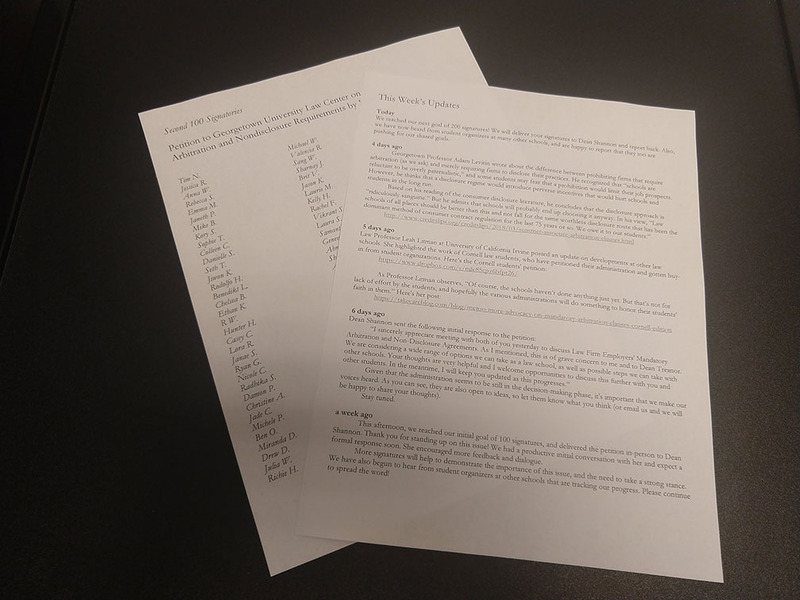 She highlighted the work of Cornell law students, who have petitioned their administration and gotten buy-in from student organizations. As Professor Litman observes, "Of course, the schools haven’t done anything just yet. But that’s not for lack of effort by the students, and hopefully the various administrations will do something to honor their students’ faith in them." "I sincerely appreciate meeting with both of you yesterday to discuss Law Firm Employers' Mandatory Arbitration and Non-Disclosure Agreements. As I mentioned, this is of grave concern to me and to Dean Treanor. We are considering a wide range of options we can take as a law school, as well as possible steps we can take with other schools. Your thoughts are very helpful and I welcome opportunities to discuss this further with you and other students. In the meantime, I will keep you updated as this progresses." Given that the administration seems to be still in the decision-making phase, it's important that we make our voices heard. As you can see, they are also open to ideas, so let them know what you think (or email us and we will be happy to share your thoughts). This afternoon, we reached our initial goal of 100 signatures, and delivered the petition in-person to Dean Shannon. Thank you for standing up on this issue! We had a productive initial conversation with her and expect a formal response soon. She encouraged more feedback and dialogue. More signatures will help to demonstrate the importance of this issue, and the need to take a strong stance. We have also begun to hear from student organizers at other schools that are tracking our progress. Please continue to spread the word! 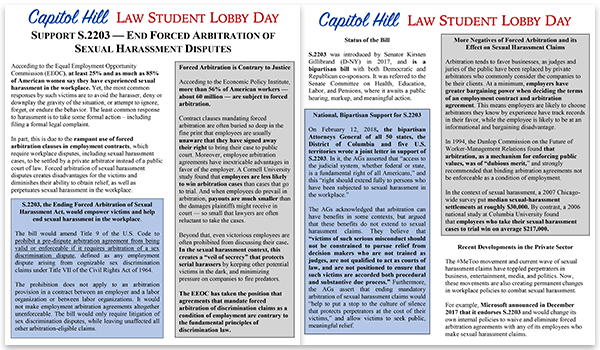 Georgetown Law students recently went to the Hill to advocate for the bill S. 2203, the "Ending Forced Arbitration of Sexual Harassment Act." Click on the PDF link to read about it.